Pioneers in the industry, we offer nappy rash cream from India. 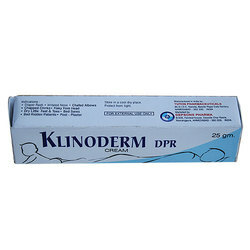 Due to our rich experience in this domain, we have been able to offer premium quality Klinoderm DPR to our valuable customers. These creams are used for the treatment of different kind of rashes. The optimum quality of the offered creams is attained through rigorous quality assurance tests conducted by our team of quality controllers. Dry little Feets & toes.